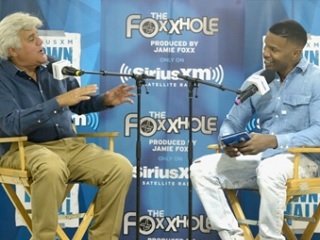 Comedian cracks about politics and more during SiriusXM chat with Jamie Foxx. During a recent SiriusXM Town Hall session hosted by Jamie Foxx and held at Leno’s Burbank, Calif. automotive HQ, the comedian suggested that the Jeb Bush–Donald Trump showdown is “kind of like the race between the tortoise and the bad hair.” The former Tonight Show host also had some pretty good lines about Hillary and Bernie Sanders. At another point in the conversation, Leno and Foxx traded thoughts about their stand-up comedy influences. Intriguingly, Leno said he made a point during his early days in L.A. to deliberately try and follow Richard Pryor on the comedy stage, to forcibly up his game.